The European Union Says It Wants To Join The Drone Club : Parallels Seven EU countries said they would form a club to produce military drones. The European project would join drones made by the U.S., Israel and more recently China. 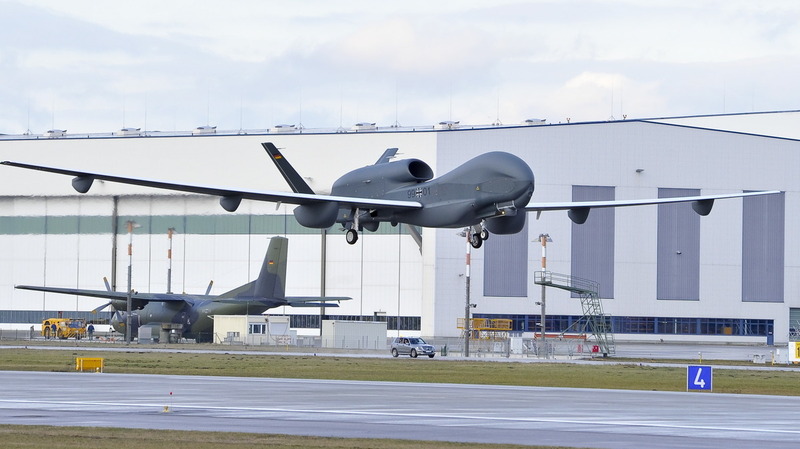 A handout picture shows Europe's biggest drone, Eurohawk, made by Northrop Grumman, at the start of its first test flight in Manching, Germany, on Jan. 11. If European officials have their way, the European Union will have its own drones within the next decade. Seven EU countries say they want to join forces and start making their own military drones by 2020 rather than relying on the Americans. The EU Observer website reported that the proposed "Medium Altitude Long Endurance (Male) craft ... can be used to strike military targets or for surveillance of migrant boats in the Mediterranean Sea." European nations currently use U.S.-made drones for military operations. Britain used U.S.-made Reapers in Afghanistan and France used the Reaper in Mali. It's hard to predict what the political atmosphere will be like if and when a European drone takes to the skies. Drones have emerged over the past decade as an important part of the U.S.-led war on terrorism. They have been used to kill militant leaders in Pakistan, Yemen and elsewhere. But they have also caused civilian casualties as well as raised questions of sovereignty. Military drones are also an important source of revenue for the countries that make them. A report by the Teal Group estimates that spending on unmanned aerial vehicles, or drones, will more than double over the next decade to $11.6 billion annually, totaling nearly $90 billion over the next 10 years. "The U.S. will remain the largest producer and operator of UAVs throughout this decade, accounting for about 45 percent of the global market. Israel is the world's second largest UAV producer – and the largest exporter, selling systems to some 49 countries, with fewer use restrictions than the U.S. places on its customers." China has recently made great strides, too. The China Daily reported that at least three countries have bought Chinese military drones.